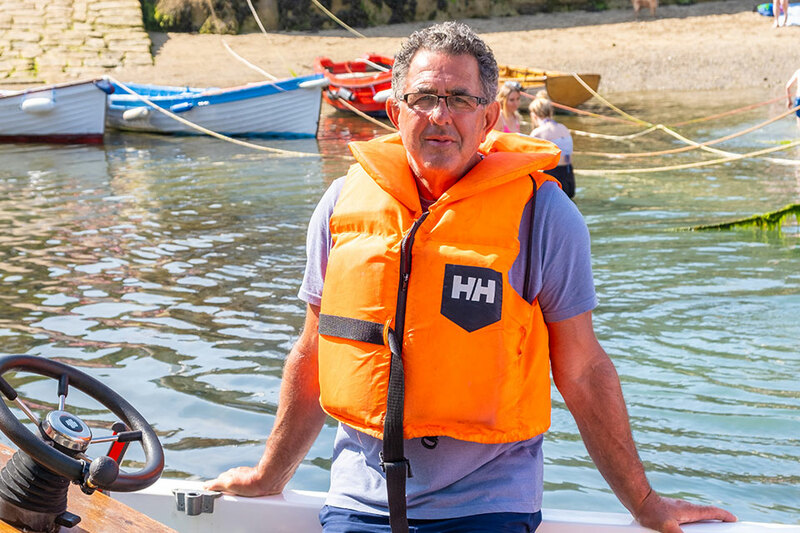 Ken is a native of Dalkey, coming from a strong boating background. His knowledge of the sea and the waterways of Dalkey sound are second nature to him. Ken is an oarsman in the east-coast rowing community for the past 45 years. Ken's boat "Lilly Rose" was named after his grandaughter who unfortunately died shortly after being born. The boat was commissioned by him as a ferry passenger boat. The boat suits his operation perfectly as it is small enough to be able to access the tight inlet of Dalkey Island. The Lilly Rose has passed the stringent tests set out by the Department of Marine and is licensed to carry five people. Life jackets are provided for all age groups. Infant to adult. Ken holds all the necessary qualifications as required by the authorities. HOURS OF OPERATION: 7 days a week - 10 o'clock to 6 o'clock After hours appointments available on request. The island's original occupants were from the Mesolithic or Middle Stone Age. The island is also an ideal spot for fishing, with Pollock, Coalfish, Wrasse and Mackerel being caught. Dalkey is a suburb of Dublin and seaside resort just south of Dublin City, Ireland. It was founded as a Viking settlement and became an important port during the Middle Ages. According to John Clyn, it was one of the ports through which the plague entered Ireland in the mid-14th century. In modern times, Dalkey has become a thriving seaside suburb and a minor tourist attraction. It has been home to many writers and celebrities including Maeve Binchy, Hugh Leonard, Bono and Van Morrison. Ireland is where strange tales begin & happy endings are possible. Dalkey Island is home to a colony of seals which has greatly expanded in recent years. A herd of wild goats live on the island also. Birdwatch Ireland have established a colony of Roseate Terns on Maiden Rock just north of the Island. More recently a pod of three bottlenose dolphins has begun frequenting the waters around Dalkey Island. An island on the tides of time. The archaeology and architecture of Dalkey Island shows evidence of thousands of years of settlement. Its origins go back at least 6,500 years to the Mesolithic era. There is evidence that settlement continued through the Neolithic, Bronze and Early Christian periods right up to the use of the island by the military in the nineteenth century. It is the largest of a group of small islands, namely: Lamb, Muglins and Maiden Rock. It is about 11.2 hectares. Dalkey Island, on one hand, is a wild and isolated place, devoid of human habitation. On the other hand, it is an exciting treasure trove of history, heritage, architecture, archaeology, and ecology. Its most prominent features are St Begnet's Church, the Martello Tower, and the Gun Battery. Further exploration will reveal an early medieval promontory fort and large rocks with cross inscriptions to the west of the church. Rare flora and fauna and wildlife abound and care must be taken not to disturb any of it. A visit to Dalkey Island is an amazing experience. One is just 300 metres from the mainland but a lifetime away in an experience of peace and tranquility.